Keeping your kids safe and well is your top priority right? So when they get a boo boo, why use paraben laced creams and ointments to stop the hurt?. Every day life is filled with too many boo boos to ignore the toxic ingredients in run of the mill pain releif creams! Whatever little mishap, Topricin® Junior Children's™ Pain Relief and Healing Cream can stop the pain! Specially formulated for kids, this pediatrician recommended topical cream is paraben free, odorless and all natural. Topricin Junior even won the 2010 Parent Tested/Parent Approved (PTPA™) Seal of Approval! 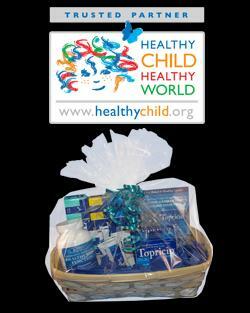 Now you can enter to win a FREE basket full of Topricin products. It is really easy and no purchase is necessary. Just visit Healthy Child, Healthy World to enter.